The Wilson Reading System® is an Orton-Gillingham designed, multi-sensory language program. Its strength lies in its high level of structure and focus on fluency. Few reading systems offer a more methodical approach to re-mediating everything from simple reading comprehension difficulties to dyslexia. This peer reviewed and award winning curriculum offers comprehensive language instruction in not only decoding and encoding but also in reading fluency, reading comprehension, and vocabulary acquisition. Unique and tactile materials are supplied to solidify abstract concepts, and extensive collections of decodable texts provide plenty of opportunities for reinforcement. Additionally, a concentration on nonsense words reinforces mastered rules while prompting the student to decode based on his/her understanding of acquired code rather than depending on visual memory. In our experience, Wilson is the most comprehensive approach to effectively re-mediating a reading and spelling deficit. The Wilson Reading System is appropriate for grades 2-12 and usually requires three weekly one hour sessions in our learning center. Progress is monitored primarily with the Wilson Assessment for Decoding and Encoding (WADE). For grades K-3, Wilson now offers FUNdations. This new addition begins with letter formation and recognition and steadily integrates/advances code knowledge and phonemic awareness in a fun and interactive manner. 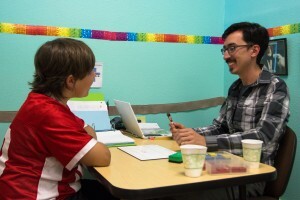 To find out if the Wilson Reading System is right for your child call us now at (909) 606-4863 for an introductory consultation that includes a basic decoding assessment at no charge.